Was £6.00, then was £3.00 - and after waiting a while it's finally down to the very affordable £1.50 for 800g - about 19p per 100g I think! I only bought two because it's all I could fit in my bag Eat in moderation. Edit: Changed to a London deal for those complainers out there. "Bet you can't put one in your mouth without chewing it"
Why did you pay £3.50?!? With 1600grams of sweets in tow, I dare say the OP lobbed a load of change into a self-service machine...grabbed whatever change came back, and scarpered! 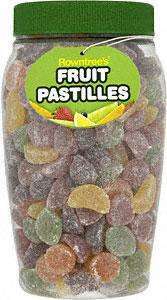 Just a question, from your reciept i see you gave the cashier £ 3.50 when the sweets came to £ 3.00. i must ask why???? considering she then gave you 50 pence change. Why not just give her £ 3.00. My guess is OP starts using self service till with a pocket full of change, starts putting the change in.. 50p x 5.. but oh no! No more 50p pieces.. so has to bang a quid in. Will look out for these next time I go to Tesco, great price! My guess is OP starts using self service till with a pocket full of … My guess is OP starts using self service till with a pocket full of change, starts putting the change in.. 50p x 5.. but oh no! No more 50p pieces.. so has to bang a quid in. These were in Tesco London Victoria, 5 minutes walk from the station. They've had crates of them left since Christmas but weren't selling any - they should shift a lot faster at this price though! Should be nationwide wherever there is stock. I see the word Tesco and my heart sinks. I have never, not once, found a Tesco deal advertised here to be available in any store near to me. So why do I always read the damned things? I got given one of these at Christmas, I'm just coming to the end of the tub now, this would be a nice refill. Although I really shouldn't. These are rather moreish, so go careful with them or you may give yourself a heart attack! MMMM blackcurrent!!! MMMM orange!!! MMM strawberry!!! Cant see any on the tesco website...so must be just certain stores..
That's what I thought until I found this deal Plus, quite a few people are in London who might be able to head to this specific store if they feel like it. I see the word Tesco and my heart sinks. I have never, not once, found a … I see the word Tesco and my heart sinks. I have never, not once, found a Tesco deal advertised here to be available in any store near to me. So why do I always read the damned things? Praying that there are still some there tomorrow lunchtime! All gone in this store now.